If you are looking for a place to store grain and feed, a shelter for a pony or a goat, or just a place to put your garden tools, a small barn is an ideal shelter for your farm, pasture or backyard. The simplest building plan for a small barn is a pole barn structure. A pole barn can be built with a pole framework from which an exterior is hung. Most pole barns can be assembled in just a few days. Pole barns are made with pole structures that are 12 to 18 inches in diameter. These poles can be constructed of wood or metal. The most common kinds of pole structures are built from wooden logs, pressure-treated landscaping timbers, utility poles or tree trunks with the branches removed. Poles also might be made from metal posts. The exterior may be made of boards, tin or left open with only a roof for shelter. Constructing the pole frame is the most important part of the pole barn. 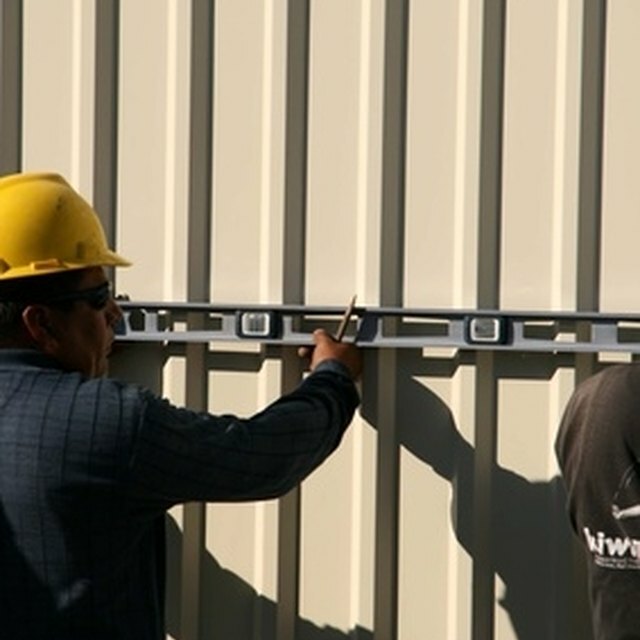 This will determine how tall your structure is, and the overall shape. Most pole barns have no foundation, or a foundation that is poured after the poles are set in place. The poles are generally augured into the ground and buried to a depth between four and 10 feet. The taller your barn will be, the deeper the poles should be sunk. The poles should also be no further apart than the spacing of your boards or tin siding. The closer you set your poles, the sturdier the structure will be. Once your poles are in place, you can float your concrete slab, if you choose to have one, by pouring the concrete directly onto the ground into the skirtboard of the pole barn. Then set your trusses on top of the poles. After your structure has been framed, finish your barn by attaching the exterior. Many pole barns are constructed using tin, but some use wood--or you could choose a decorative exterior sheathing of siding, brick or stone attached to a wooden backing for a long-lasting and beautiful exterior. To attach the exterior, hang the wood or tin from the poles using nails or bolts. Cover the roof in a similar fashion. Once your pole barn has had the exterior attached, you can wire it by attaching conduit pipe to the pole frame and running wiring through the pipes.